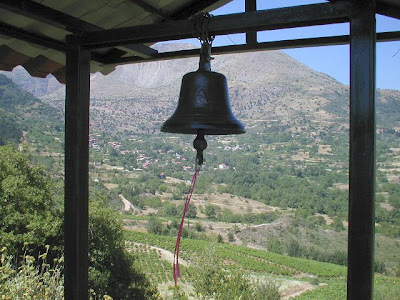 The love Greeks have for the Panagia, and in return the love the Panagia has for the Greeks, is manifested through the numerous churches and monasteries dedicated to her throughout Greece. Out of 8660 parishes in Greece, 1900 are dedicated to the Theotokos; and of the 490 monasteries of Greece, 170 honor her as their protectress. 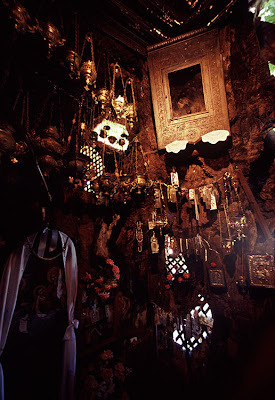 And one of the most beautiful and astonishing shrines of the Panagia is found in a small village of Kalavryta known as Plataniotissa. The history of this shrine goes back to the year 840 during the dark days of iconoclasm. 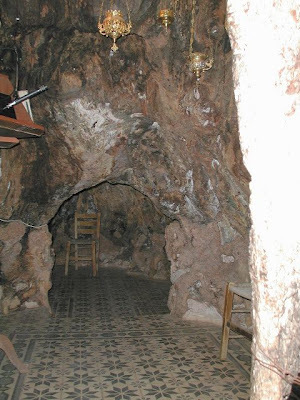 It was at this time that the most famous shrine of Kalavryta, the Monastery of Mega Spelaion (Great Cave), was torched. 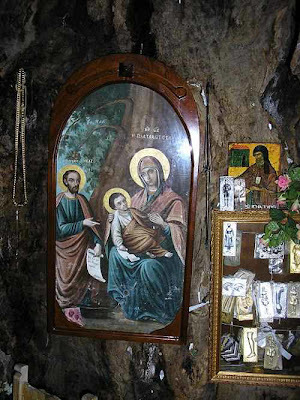 This Monastery was built in a very large cave five centuries earlier which in apostolic times served as a church in which the Apostle Luke celebrated the Divine Liturgy and according to tradition sculpted the miraculous image of the most pure Virgin known as Mega Speliotissa. During the torching of the Monastery, its beloved icon and its treasures were preserved. 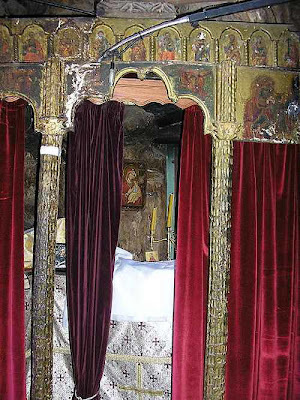 As the church of the Monastery was being rebuilt, the abbot of Mega Spelaion took the sacred icon and went to Patras and Aigio to preach the Orthodox faith. 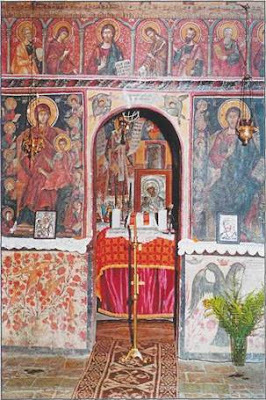 When the church was rebuilt, he planned to return and restore the icon in its temple. That same year, as the monks from Mega Spelaion Monastery were returning from their sojourn in Patras, they spent the night by the bank of the river in the village of Klapatsouna (as it was called back then). It was on this spot in the fourth century that the founders of the Monastery of Mega Spelaion, Saints Symeon and Theodore, beheld in a vision the three Apostles who in their lifetimes preached and established churches in that area of Achaia - Sts. Paul, Andrew and Luke. This is where these Apostles instructed Sts. Symeon and Theodore to find a shepherd girl named Efrosyne who would lead them to the site of the ancient church and sacred icon. 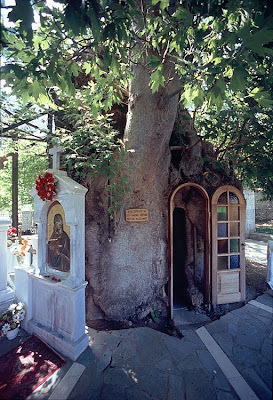 Thus while resting in this same spot, the monks decided to hide the Mega Speliotissa icon in the hollow of a plane tree to protect it from the iconoclasts. In the morning the monks arose to find a miraculous wonder. The spot where they had left the icon there was found an imprint of the image in the hollow of the hard surface of the plane tree, and this identical image was bathed in light. 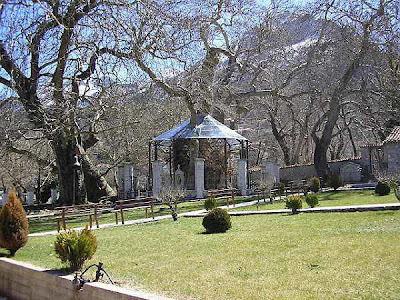 This remarkable phenomenon of the imprint is preserved to this day and a chapel now resides in the hollow of the tree. 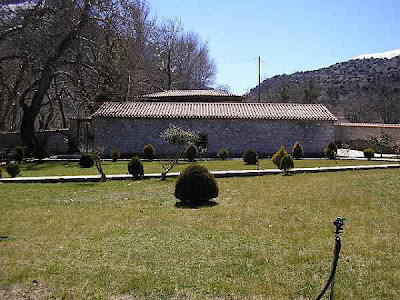 The chapel can be found on the way from Kalavrita to Aigio via Pteri, at around 30km from Kalavrita. 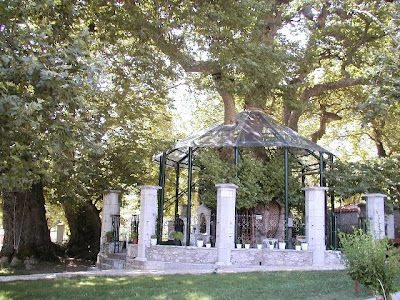 In a beautiful green location with abundant spring waters flowing around, the small chapel of Panagia Plataniotissa (All Holy Virgin of the Plane Tree) is tucked inside the hollow of a large plane tree. Its an amazing and unique natural phenomenon which was created when three plane trees sprung out close to each other and over the course of time they united. These three plane trees which have been united as one are considered by the faithful as being an image of the Holy Trinity, while the four plane trees which surround them symbolize the four Gospels. 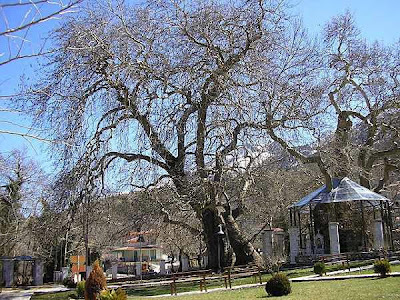 This historical plane tree measures 25m in height, its base circumference is 16m, and around its middle it measures 12.65m. The hollow can fit approximately twenty people. The sacred imprint of the icon of the Virgin Mary is depicted on the tree’s bark 3m above the ground. An altar area with iconostasion is set up for the service of the Divine Liturgy. 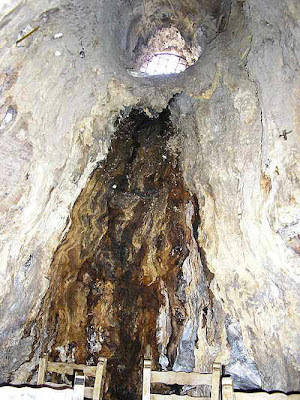 On the southeastern wall of the tree is the only window which together with the door bring in sunlight. The iconography within the chapel was done in 1740, and although has amateur characteristics, it encourages a sense of piety and faith among visitors. Many miracles are done here for the faithful by the grace of the Panagia. Within the hollow are gifts of metalic images which bear testimony to the miraculous powers of the imprinted image. It is also said that on August 23rd each year, which commemorates both the apodoseis of the Dormition feast as well as the day on which the Monastery of Mega Spelaion was founded, a luminous sphere of light descends from the area of the Monastery and comes to envelope the plane tree. This phenomenon causes many to sleep outdoors by the Plataniotissa Chapel, so that they might catch a glimpse of the holy light. The feast day of the Plataniotissa Chapel is officially celebrated on September 8th each year, to honor the Nativity of the Theotokos. Hundreds gather from throughout Greece to participate in the festivities. ἐν κρύπτῃ δένδρων διεβίωσεν ὡς τοῦ τέλους. καὶ ἐνεδύθη τοῦ χειμῶνος τὴν λευκότητα.